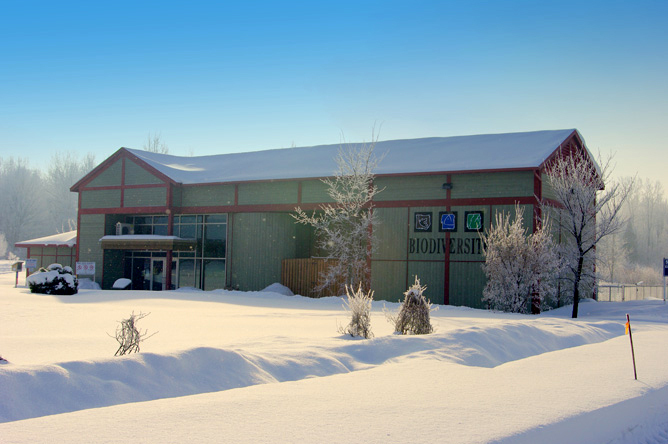 The Centre de la Biodiversité du Québec, located in Bécancour, showcases exhibitions intended to raise awareness of biodiversity and conservation efforts in Quebec and of sustainable development initiatives worldwide. The experience is enriched by a range of outside activities. Visitors can explore a network of trails that passes through eight distinct ecosystems, pick their own apples in the orchard and meet the animals on the miniature farm. 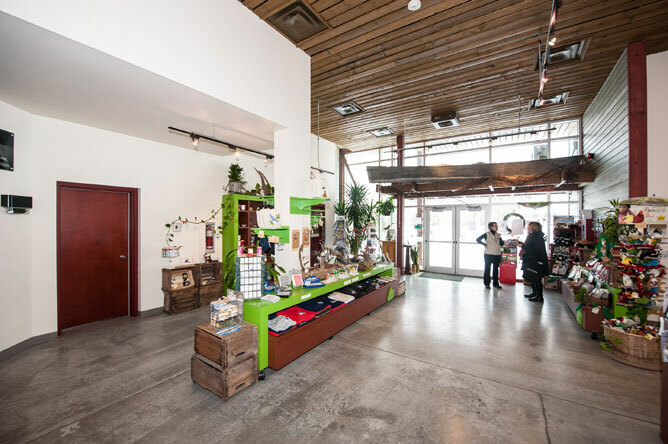 Since it opened in 1997, the Centre has undergone many changes. A major renovation and expansion in 2009 allowed it to welcome visitors year-round. Pieces by artist Dominique Laquerre above the door to the presentation room seem like windows into the animal world. Since 2000, director Carole Bellerose has worked to develop the educational, cultural, environmental and touristic aspects of the Centre. Her 15 years' experience as a tourism manager gave her an in-depth understanding of the Lake Saint-Pierre biosphere reserve and its region. First, she draws our attention to a small boat hanging above the door of the main hall, which was likely made in the Bécancour region during the 19th century. She decided to display this artifact in the reception area. Next, she eagerly take us on a tour of the museum's various exhibition rooms. In the dim, bluish light of the H2O room, visitors feel as if they have plunged beneath the water's surface. This effect is heightened by the enormous aquariums containing a variety of fish from the St. Lawrence. 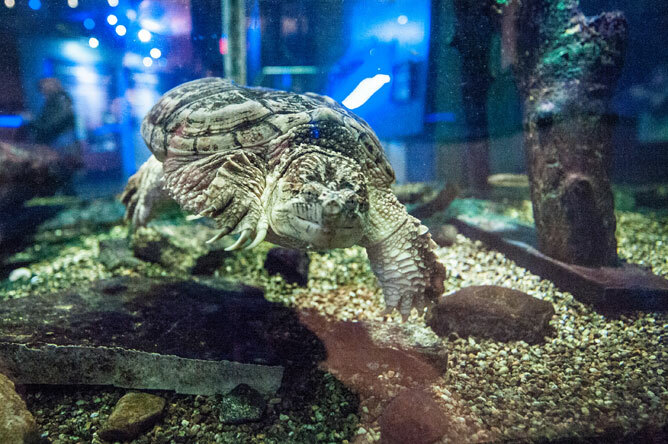 One aquarium offers the rare opportunity for visitors to get a close look at a surprisingly large seven year old Snapping Turtle. Unsurprisingly, this turtle is the star of the H2O room. Its prehistoric appearance contrasts with its tame behaviour. It's impossible to remain indifferent when you come face to face with this reptile, which seems to stare at you knowingly. 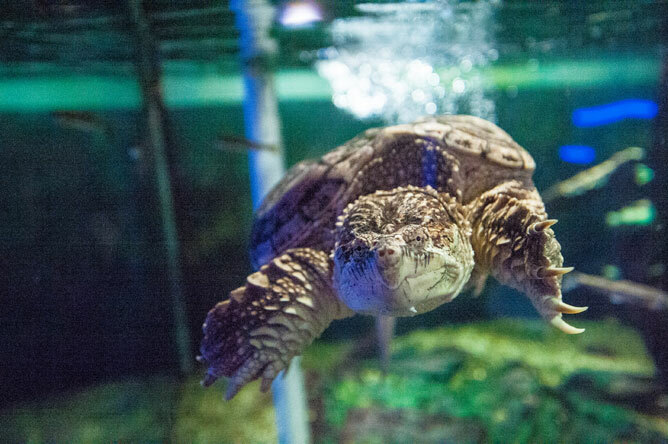 Visitors are always amazed to see how the turtle follows them around the aquarium, swimming towards them to get a better look. According to Ms. Bellerose, "children of all ages immediately fall in love with the turtle!" 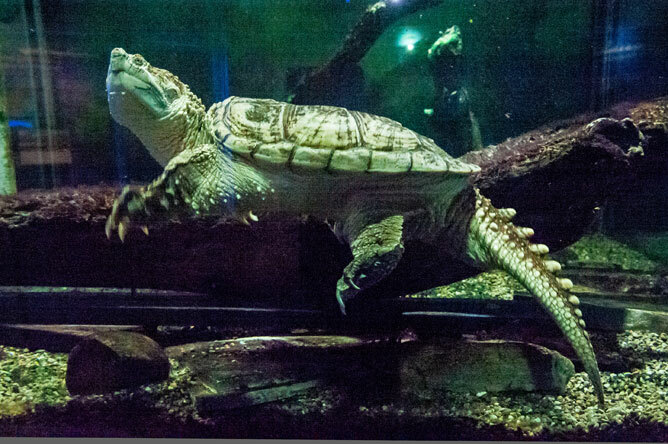 Snapping Turtles in captivity live a much less stressful life than they would in the wild. This peaceful lifestyle is reflected in the turtle's perfect, unscarred carapace and very long claws. 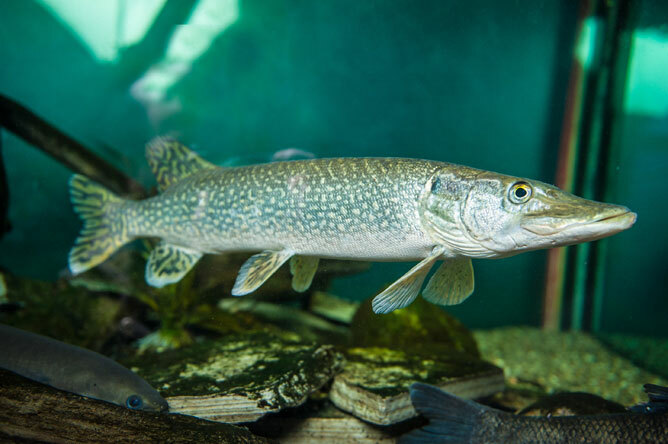 These large tanks are suitable even for such imposing fish as this pike, which is a formidable predator. 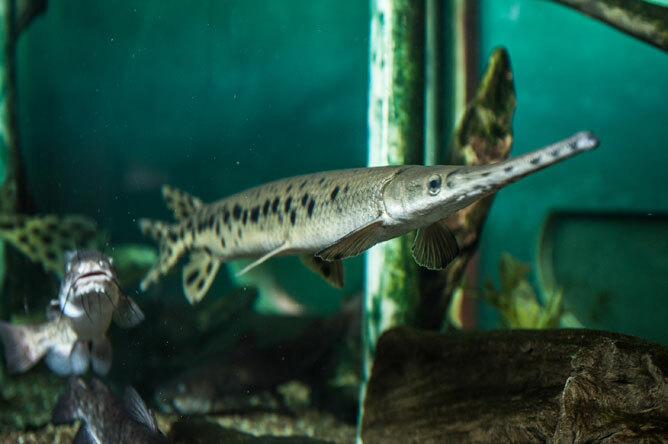 The tanks showcase the diversity of local fish species, from the Longnose Gar with its thin, pointed beak to the Brown Bullhead with its wide mouth and whiskers. In the Exploration room, Carole Bellerose shows us the temporary exhibit "From Dinosaurs to Mammals". 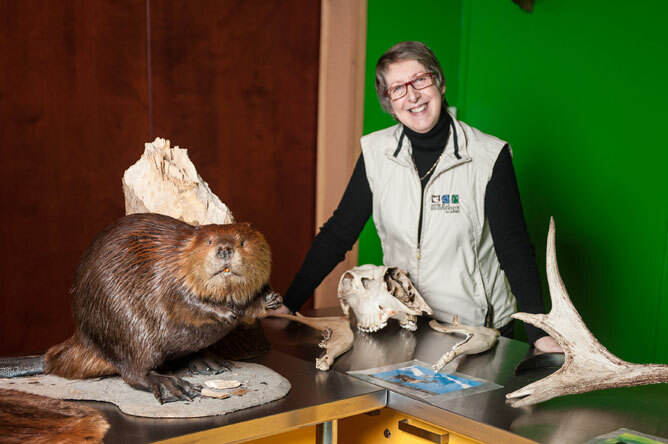 This exhibit showcases items from the Canadian Museum of Nature and the collection of the Centre de la Biodiversité du Québec, such as this impressive mounted beaver, with its glossy fur. 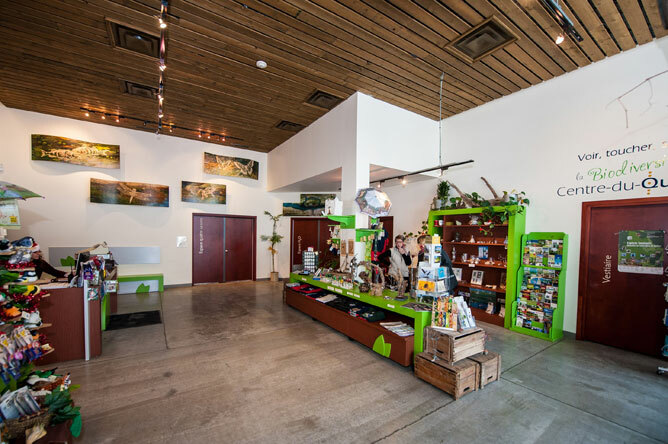 The Discovery room allows visitors to explore the world of reptiles. 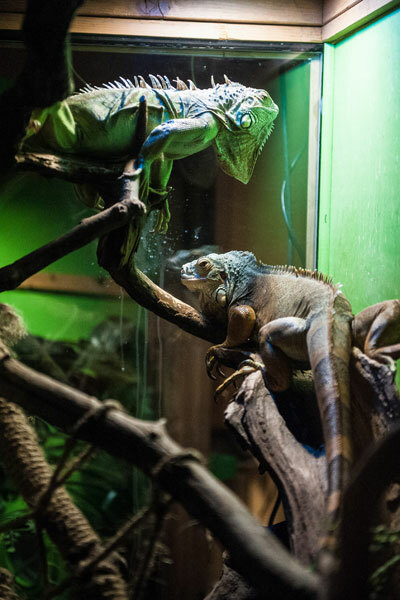 It displays specimens from around the world, such as these iguanas. 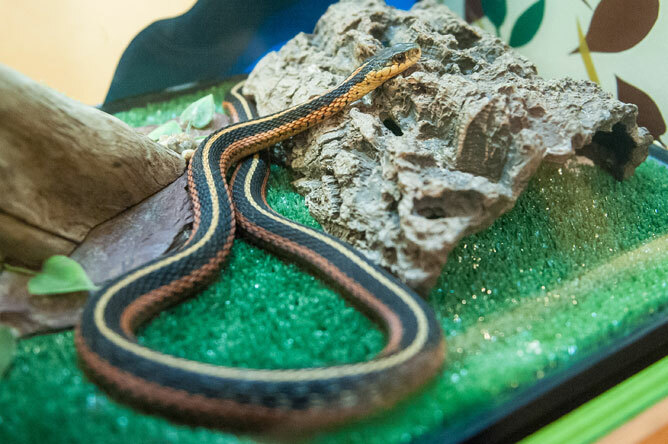 The exhibit also includes Quebec reptiles, such as this Common Garter Snake. After the Discovery room, we enter the Sensory Corridor. 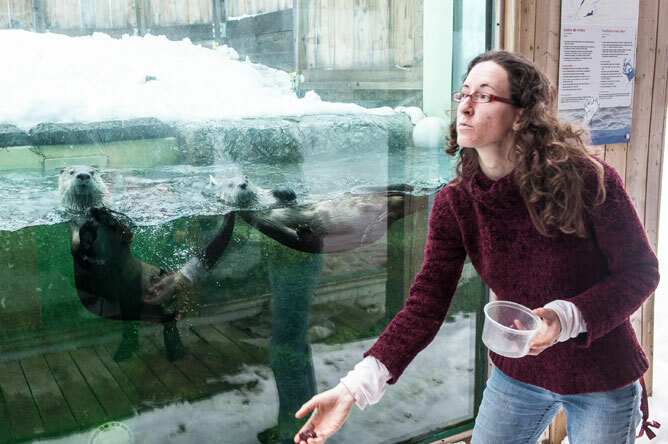 This room has a glass wall to allow visitors to observe a pair of otters as they swim in the pool in their outside enclosure. Here we see museum guide Caroline Labarre feeding the otters. 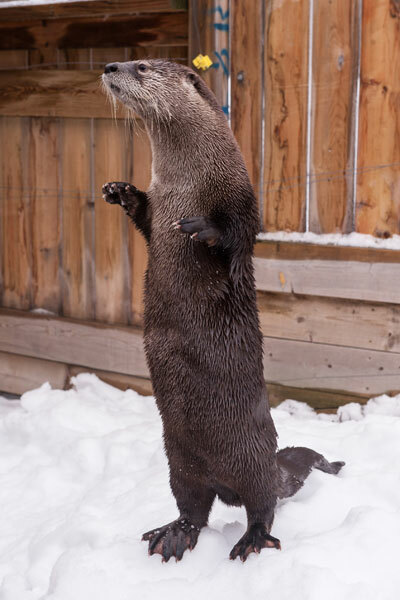 One of the otters even does tricks for its meat ration. The two otters are very active. 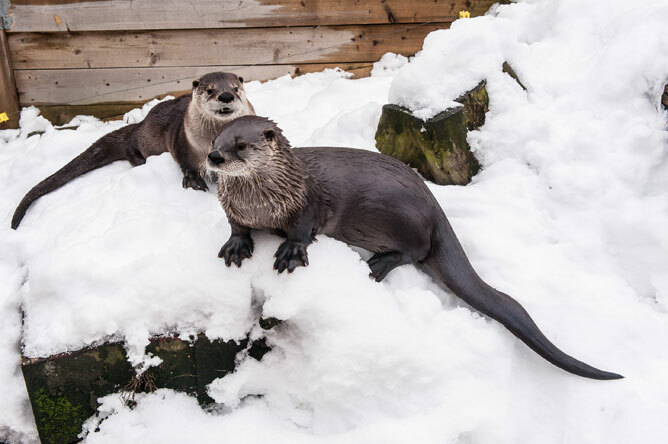 They love to roll in the snow, then dive back into the water. 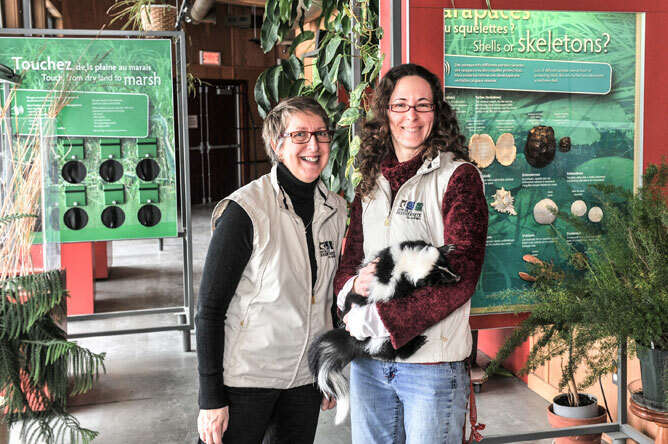 The Striped Skunk is another star of the Centre. Here we see Caroline Labarre holding the skunk, next to Carole Bellerose in the Sensory Corridor. This exhibit uses fun interactive activities to teach visitors by appealing to various senses: sight, hearing, touch, and smell. This skunk's scent glands have been removed so it is unable to produce the noxious liquid that serves as its main line of defence. It would be very difficult for a de-scented skunk to survive in the wild. Many of the animals used by the Centre for educational purposes were adopted and then abandoned by humans. These animals would be unable to survive in the wild. 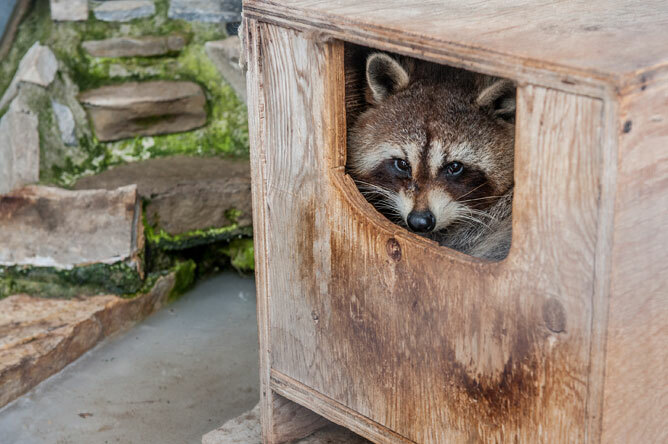 The Centre keeps animals, such as this raccoon, in outdoor pens. Carole Bellerose plans to add more enclosures to hold other species of animals. 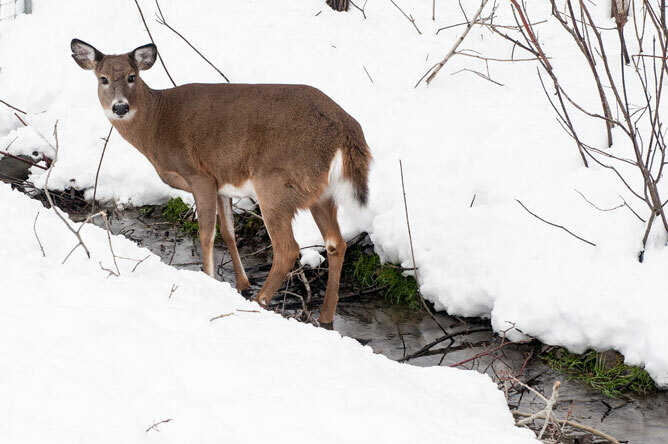 Along the trail near the Centre, visitors can observe various animals in their respective pens: foxes, wild turkeys, and maybe even a White-Tailed Deer drinking from a stream at the edge of the woods, barely seeming to notice their presence.